If you are a customer of Sberbank, that is, in one of its branches you opened your account or cards to manage their accounts through the Internet from the comfort of home. To have this opportunity, you need to connect to "Sberbank Online". With the Internet this service will allow in any time of day from any computer located anywhere in the world, pay phone, Internet, TV, utility services. Why to use the "Sberbank Online"
Taking advantage of the "Sberbank Online", you'll have the ability to transfer money from the card of the savings Bank to any other card of any person, and it may be any other Bank. Transfer money from the card of Sberbank it is possible to e-wallets Yandex.Money or WebMoney. "Sberbank Online" allows to monitor information on its deposits, accounts and cards. From home, you will learn whether you received a pension or salary. No need to waste time and power waiting in the queue. You can get money even when you are in the country or go to visit children. "Sberbank Online" will provide an opportunity to pre-learn, if there is money on the card. To connect "Sberbank Online", you should go to a Bank and write a statement about the connection of this service, rather you will only need to sign documents provided by the operator. Connection services free of charge. Branch of the savings Bank when the service will issue you with a user ID and password. ID and password to login to Sberbank Online you can get an ATM card. The check will be given 20 one-time password, the validity period is unlimited. Logging in for the first time, in addition to ID and password, you will need to introduce additional, one-time password. For convenience, don't forget to delete from the list of used disposable passwords. For payments and transfers to third parties will be required to confirm one-time password. If your check was lost, then you need to change your permanent password and one-time passwords to block. Card in the ATM should receive one-time passwords for a new check. After a new check you have received the previous one-time passwords are no longer valid. 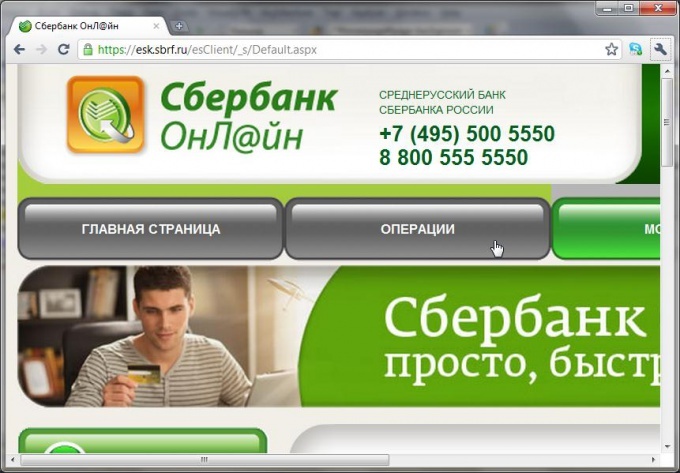 In order to use the Sberbank Online, you need to connect service "Mobile Bank". Those who make the statement in the savings Bank Department, just specify in the Generic contract your mobile phone number. When you log into Sberbank Online on your mobile will receive SMS notifying you about it. If you receive a message of this sort, but they were not included in the personal account, immediately inform of unauthorized access to Sberbank. Start using Sberbank Online is quite easy, visit only once your branch Bank and apply for service connection. It is much more convenient than going to the Bank each time to receive or send money.